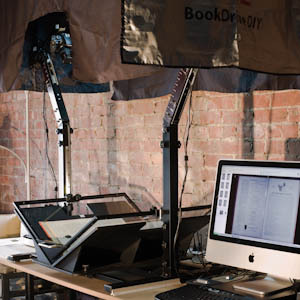 The Digital Ark utilizes an innovative book digitization solution that cost-effectively creates e-books (electronic-books) utilizing the latest in software and hardware imaging technologies. The Copystand combines two high-resolution digital SLR cameras with a v-shaped book cradle and platen to simultaneously capture both pages for sharp, curvature-free images. OCR (optical character recognition) text conversion is optimized to seamlessly produce accurate, searchable PDF documents that can be viewed on a computer or wireless reading device like the Amazon Kindle. The image processing software is developed specifically for use with old, faded prints and historical works thereby producing high-quality images that are ready for distribution and archiving.